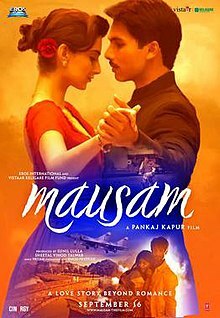 Mausam is an upcoming movie starring Shahid Kapur and Sonam Kapoor directed by Shahid's father Pankaj Kapur.The cast includes Supriya Pathak and Anupam Kher. Music is by Pritam Chakraborty and lyrics by Irshad Kamil. Sung by Shahid Mallya , the song is a sweet melody with a sufi and punjabi touch in the music beats of the song. The lyrics represents the hesitation and shyness faced in love. The song connects instantly and is in the league of Ajj Din Chadiya from Love aaj kal. This is one of the best songs in the album. The verdict for the song is Outstanding. Read on to find out if it is the best of all. The song sung by Mika Singh and Pankaj Kapur. Ofcourse how can a Pritam album be without a Mika song. The singer has been a regular in most of Pritam's albums. The peppy dance beats with the drums of the foot tapping number are similar to Nagada from Jab we met or Bhootni ke from Singh is Kingg. It is a typical punjabi song with teasing lyrics addressed for NRIs. As far as picturisation is concerned we get to see this number for a marriage. The second lead Aditi sharma is also picturised in the song. The verdict for the song is good. The song sung by Hans Raj Hans captures the sadness of separation in love. Hans Raj shows how we miss his soulful voice in hindi picture all these years. The song is in the league of Tadap Tadap from Hum dil De chuke Sanam or Aaoge Jab Tum from Jab we Met. The verdict for the song is Outstanding. The song begins with only the voice of Rashid Khan without instrument beats for more than a minute. It is a sad number capturing the essence of completeness in love without partner. The song seems situational . The verdict of the song is Good. Sung by Karsan Das Sagathia the song is a mix of Gujarathi Duha with Sufi music an interesting mix. The dance number is in the league of Dholi Taro Dhol Baje from Hum Dil De Chuke Sanam. The song captures the ecstasy after reunion of two people separated. The verdict of the song is Very Good. Here comes a typical Shahid Kapoor dance number customised for his dance. Tochi Raina returns after his composing stint with Vishesh films. The song is in complete contrast with all the songs in the album so far.It is interesting to see whether the picturisation has captured the dance beats accordingly. At times the song sounds like a remix song which mostly end up as the closing credit sequences. The verdict for the song is Very Good. Now we may be wondering why the song has repeated again. It is neither remix nor reprise version. Well Pritam seems missing his favourite singer Rahat Fateh Ali Khan's voice. The song which is typically sung by Rahat has Shahid Mallya singing the earlier version. While reviewing the song earlier we mentioned how the song is in the league of Aaj Din Chadiya. So it may be natural that Pritam wanted Rahat to sing it. Perhaps he may have felt that Mallya's version is better and the promos ended up with that version. We sure can't agree more. The verdict for the song is Good. The song has some fast pace and additional beats than the original. I am prejudiced against remixes normally. But I have to make an exception for this one surely. If the original is a wine in a bottle the remix is a 40 year old wine which just got improved in beats and tweaks. This version is certainly better. I am surprised how they didn't use it in promos which would have certainly improved the reach of the song. The song is in the league of Mauja hi Mauja Remix. The verdict for the song is Outstanding. Now I am personally feeling a bit exhausted hearing to this may mixes. Well I am personally happy with Desi Mix Tiger style. The club Style doesnt suit the tempo of the song. At places it sounds like only drums and an army march.Sure the beats may be good but it is not coherent. The verdict for the song is average. Rahatji better keep a watch on Shahid Mallya. The reprise version is nothing different from original and makes it difficult to pick among the two which must be a success for Shahid Mallya. I personally like both the versions. The verdict for the song is Outstanding. The song from Wadali brothers is a surprisingly completely different from earlier versions and listener instantly forgets the earlier versions. The song sounds in the league of Aas Paas Khuda from Anjaana Anjaani. The verdict for the song is Outstanding. Lehmber Hussainpuri and Hard Kaur just accelerate the song more with peppy rap. The song does not dissappoint in its repeat version and I was surely not tired by this version. The verdict for the song is Very Good. This Tochi Raina song remixed by Kiran Kamath is not much different from original. There is not much to be said than the different beats and chorus. The song sounds more like Kyon Paisa Paisa karti hai from De Dana Dan .It is a disappointment and a liability for the album. The verdict for the song is average. Final Verdict : On the upside 'Mausam ' as the title suggests is a refreshing album. On the downside the album with three versions of three songs makes for most . While this may be for the better the listeners may be spoilt for choice to pick their best version, there is also a danger of their shying away due to repetitiveness of a song part. The good news is nothing can stop a good song from being a hit.